Many years ago I became fed up with so called “non-stick” pans and switched to cast iron. While I love my 12 inch Lodge with all my heart, I’ll admit that learning to clean cast iron wasn’t exactly easy. If I’m just frying eggs I wipe it out with a little oil and salt and put it away. Frying chicken or making a sauce based dish presents a different challenge. 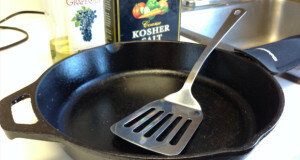 About a year ago, I stumbled across this new way to clean cast iron that I had never heard of. 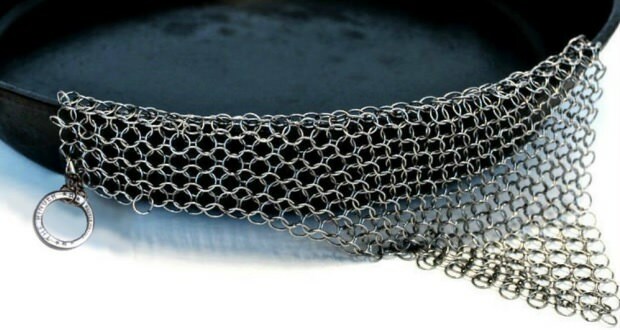 It’s called The Ringer, and it’s basically a piece of chainmail. Yes, that’s right. As in the kind King Arther would have worn, and it’s ridiculous how well it works. Now, some of you will say, “I’ve been using that for years!” Well good for you! I’m yet to have a guest visit who knows what the square of chainmail hanging in my kitchen is for. Why is it so great? Because it takes almost no elbow grease at all. 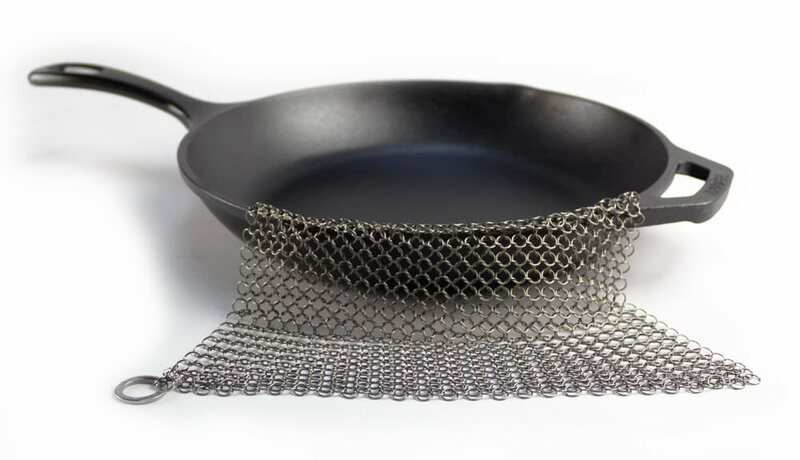 With very light pressure you can remove even the most crusty bits from your precious pan. It does not remove the patina, and for some reason The Ringer itself is easy to clean. You’d think that food would get stuck in those links like crazy, right? Not so. A little hot water from the sprayer makes it as good as new. If you have cast iron cookware trust me – you will not regret this purchase. Your new best friend in the kitchen.